This sweater kit includes enough yarn to complete the sweater indicated by the finished circumference around the body. The sweater is intended to fit loosely (with 6 inches of positive ease). 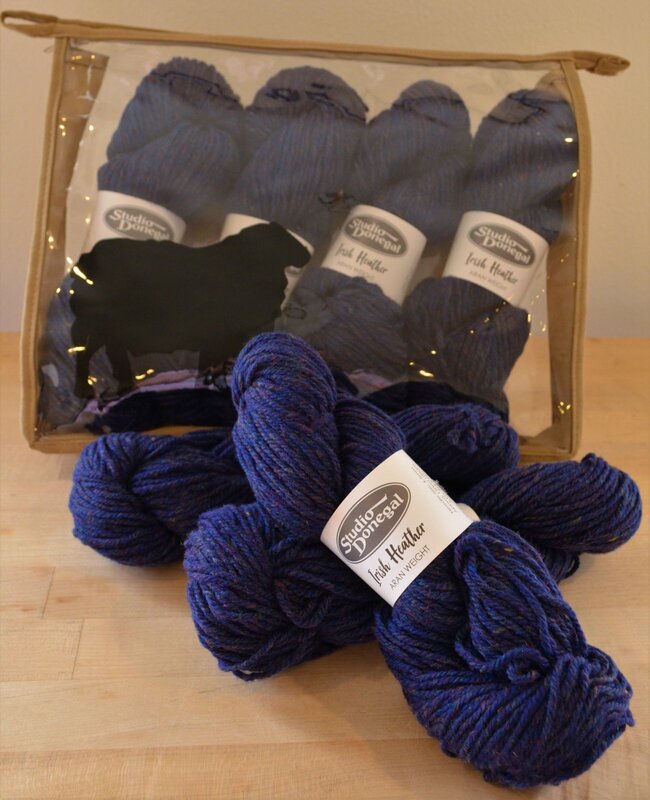 In this kit you will receive 10 or 11 skeins of Studio Donegal Heather depending on the size you choose (XL-53,XXL-57.5, 3XL-62 inches). Be sure to choose the size and color you would like. For a larger kit size, check out the Oban Sweater Kit size 53-62 inches. Introducing The Oban Sweater. Easily my favorite thing I’ve ever knit. After finishing my Oban hat last December, I just wasn’t done with this combination of yarn and cable, as it’s simple, addictive and immensely satisfying! I needed to keep knitting more, so I got a little more of this lovely Corriedale wool from Bare Naked Wools and started planning a sweater. The special thing about this one is the striking textured cable. It’s classic and simple, but the combination feels new and modern, and it really stands out when worked in a lovely, round wool such as the Confection Worsted. Details in the sweater design are simple so the texture really shines. I’ve accented the cables with a bit of honeycomb and added ribs along the sides of the sweater, both to make for easy mods and a nice clean line to seam. Sleeves feature a complimentary cable repeat on a reverse stockinette background, and the fit is loose and easy. This design really shines in a classic sheepy fiber - a classic yarn such as BNW’s Confection or Kent Worsted is round and light and lofty, and the subtle heathers in a natural shade really pop in the simple lines. You can see from my photos how it changes in the light. Cables are both charted and written. Notes are included in pattern for modifying body length and width, as well as sleeve length and width, and armhole depth. Sizes: 35(39.5, 44, 48.5)(53, 57.5, 62)“/89(100.25, 111.75, 123.25)(134.5, 146, 157.5)cm. Size based on finished circumference around sweater body. Sample is worn with 6”/15.25cm of positive ease. I recommend between 5-7”/12.75-17.75cm of positive ease, based on bust, for fit as shown. Sweater can also be worn more fitted (see test knits!). If you are between sizes, I recommend choosing the smaller one and following notes in the pattern to add width to the body. This will avoid having sleeves and armhole a few sizes bigger than you! Yardage 1350(1450, 1600, 1750)(1900, 2100, 2300)yards / 1235(1325, 1465, 1600)(1740, 1920, 2110)meters needed. If substituting yarn, note that sweater features allover cables. I do not suggest a yarn with too much weight or drape that may stretch out over time. A round worsted-weight fiber in a light wool is perfect. I suggest a solid, heather, tweed, or subtle hand-dye, as a busy yarn or colorway will compete with the textured details of the pattern. See the yarn choices in the test knits for examples.